We offer an instrumental range of products made using high quality sound level meter. Our entire range is procured from the renowned vendors of the industry, who manufacture them in compliance with the industry standards. We source these products from the leading vendors after ensuring their quality. Application:. Applicable to measure the Sound level of environment, Machinery, Vehicles, Ships & Other Noise. LCD Display with Backlight & Torch. ½ inch Electret Condenser Microphone Sensor. Power Supply : 9 Volt battery . Unit Size : 192 X 53.8 X 35 mm. Accessories: Instruction Manual, 9V Battery, Windscreen. We are offering a wide range of Digital Sound Level Meter SL4012. It is used to calibrate the sound level meters. 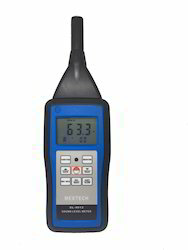 This instrument is compatible with several standards of GB/T 3785, IEC 651 Type 2, and ANSIS 1.4 Type 2.It is widely used to test the sound level of environment, mechanic, vehicle, ship and other noise. Fit for industry environment protecting, working, sanitation, teaching search and other departments.